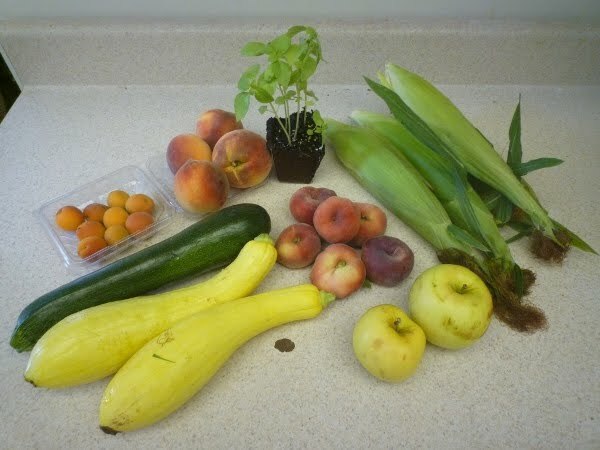 I received yellow peaches, doughnut peaches, apples, summer squash, zucchini, apricots, sweet corn, and a basil plant. -6 or 7 Roma tomatoes, chopped or one can of San Marzano tomatoes. -2 ears worth of sweet corn kernels. -2 spring onions (or one medium white/yellow onion). -3 small cloves garlic, minced. -1-2tbsp. grape seed or olive oil. -A few splashes of white wine (optional). -A few strips of dried cayenne pepper, diced (or cayenne powder to taste). -Handful of basil leaves, torn. -5 or 6 sprigs of lemon thyme leaves. -Kosher salt and fresh ground pepper to taste. -Grated parmesan cheese, to garnish. -Place the slice of bacon in the pot over medium heat until it is cooked through and the fat has rendered out. -Remove the bacon and dice it. -Add the onions and garlic to the pot, add a little bit of oil, and reduce the heat to medium-low. -Cook until the aromatics are golden-brown. Add the diced bacon. -Move the pot off of the heat and add a few splashes of wine, then return the pan to the heat and turn it up to medium. 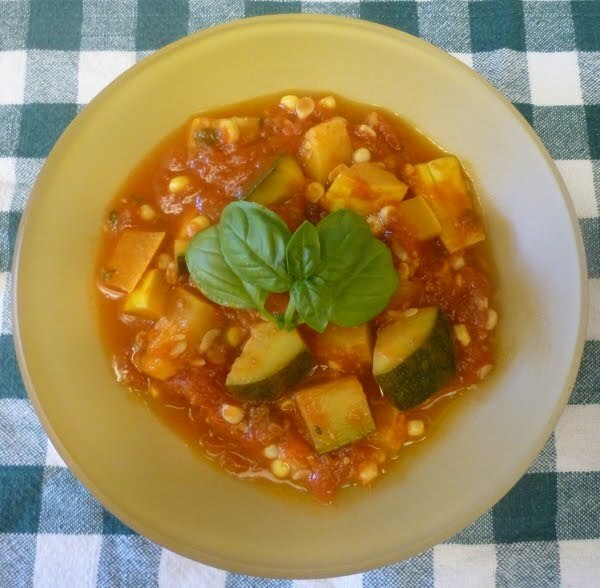 -Add the zucchini and summer squash and sauté gently for about 7-8 minutes. -Add the tomatoes, corn, cayenne, herbs, a few pinches of salt, and a few grinds of pepper. -Put the lid on the pot, reduce the heat so that the ragout is simmering gently. Cook for 1 hour, giving it a stir every 15 minutes or so, and cook until the squash is soft, but not mushy. Remember to taste and adjust your seasonings along the way! -Garnish with a bit more basil and some parmesan cheese if you like. Voila! I ate mine as it was, but ragout certainly goes well over pasta, brown rice, or quinoa. Ground turkey breast, browned and put into the pot when the tomatoes are added is another nice way to make a heartier meal. It also freezes/reheats nicely—always a bonus. There are four of them, each about the size of a kidney bean at the moment. 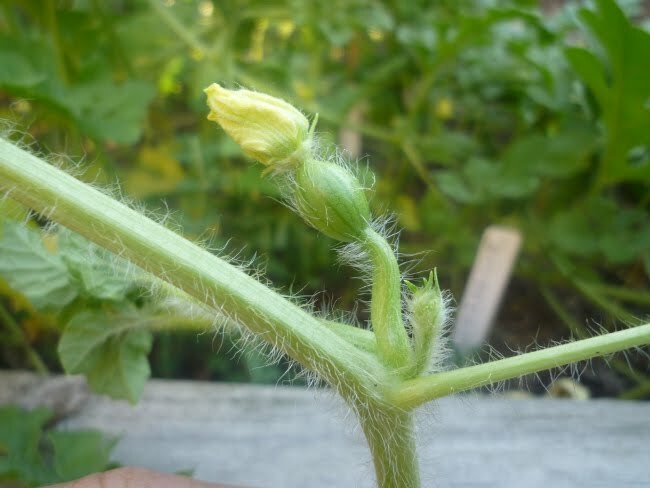 Hopefully we’ll get one or two that ripen fully. Looks delish! I actually just made ratatouille, so I understand your "stew in summer" inclination.I'd love to read more about this birthday party of yours, too…. 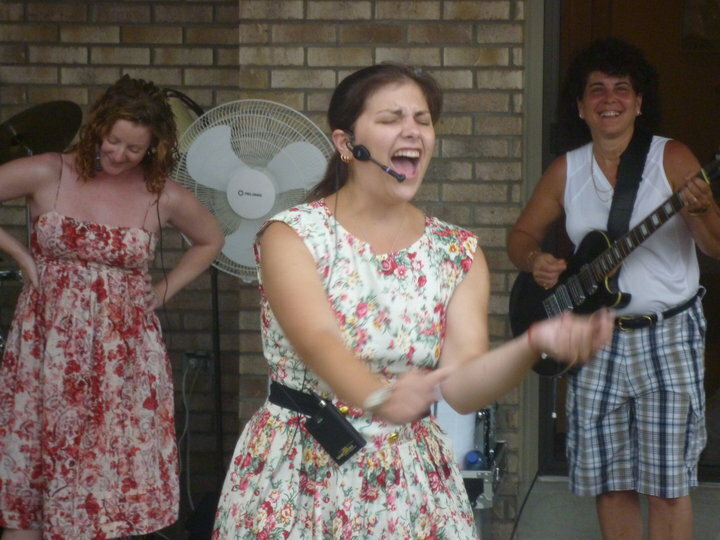 The picture alone is intriguing!